The inspiration for a bike build can come from the most unlikely of sources. 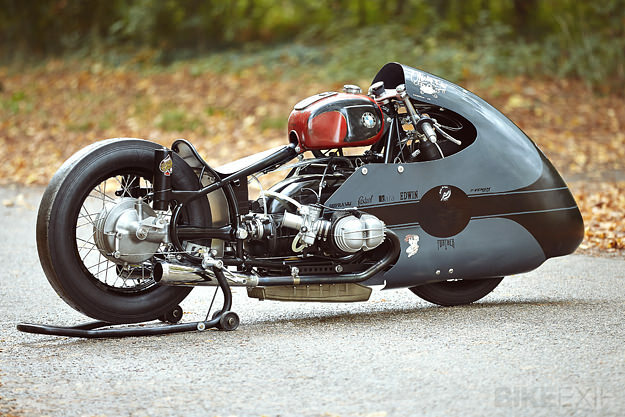 In the case of this most unusual BMW sprint bike, it was a vintage M&H Racemaster drag tire. 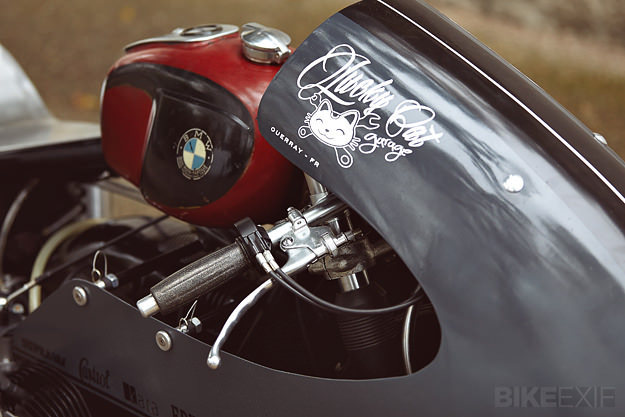 The tire belonged to the amiable Séb Lorentz of The Lucky Cat Garage, a familiar face on the European custom show circuit. While Séb was figuring out what to do with the slick, his family provided the answer: they bought him an Airtech dustbin fairing as a present. All Séb needed now was a frame, two wheels and an engine. 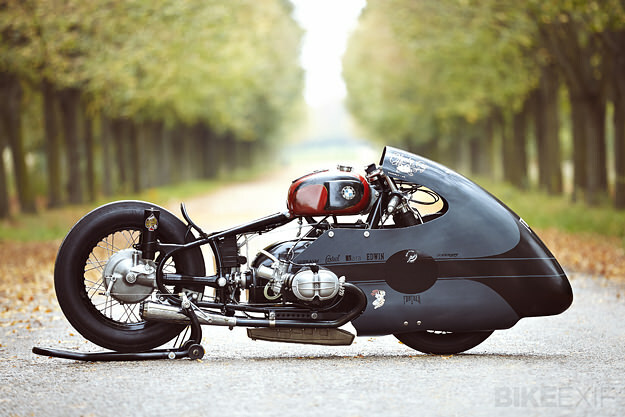 Séb is not only an accomplished builder, but also works for BMW Motorrad France. 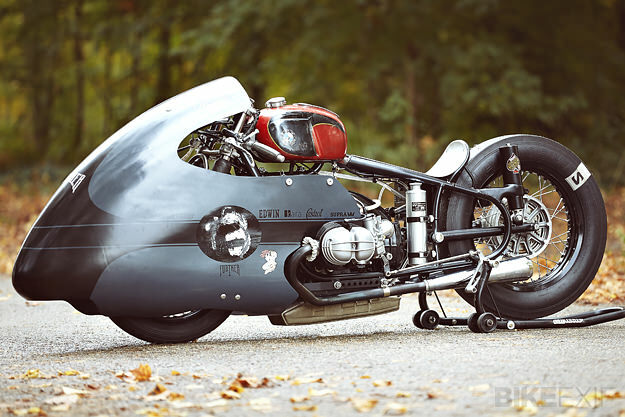 And so the Sprintbeemer was born—a bike focused on speed and acceleration, with a hefty dash of style. “It has to look fast to frighten competitors,” he laughs. The goal was audacious: to win the Starr Wars sprint race at the huge Glemseck 101 festival in Germany. Sprintbeemer is a cocktail of parts from the 50s to the 90s, with an S 1000 RR superbike battery hiding in there somewhere. The modified chassis was an R50/2 in a previous life, and the shortened fork and front stoppers have been swiped from a R75/5. Séb added an air scoop and vent holes to the drum brake, and machined the wheel hub to save weight. The swingarm is from a BMW R100/7 and the rear end is suspended by adjustable billet aluminum struts, hidden inside vintage shock covers. Power goes through a short-ratio R60/6 transmission. The drag slick that started it all has been mounted onto an 18” Morad wheel, with an Avon Speedmaster wrapped round the 19” Excel front rim. Séb is not sure what the tank is, though. It’s an unbranded barn find, maybe from a 1950s French or Italian sport moped. It’s been treated to a high-flow petcock, an aluminum cap and an engine temperature meter. 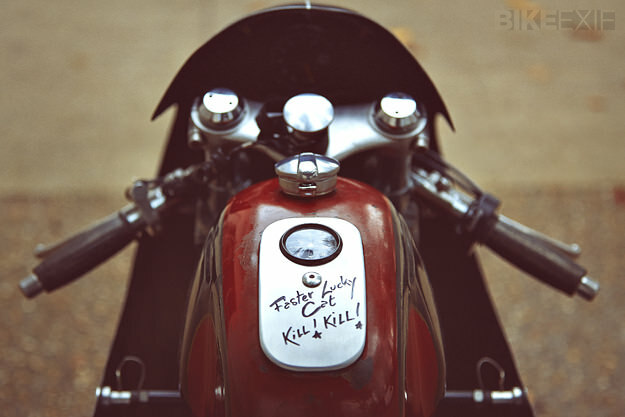 Just ahead are a Scitsu tachometer and Menani clip-ons—wearing black glitter Amal-style grips—and a Domino GP throttle. The aluminum seat pan is handmade, and the silver bottle just head of the rear wheel is an oil catch can—a modified emergency tank from Mooneyes in Japan. The star of the show is the engine, though. It’s an R 100 RS motor treated to big valves, breathing through Dell’Orto PHM 40 carbs. A 336-spec cam and lightened flywheel help the motor spin up fast, and Vattier race headers hooked up to race megaphones complete the package. The clutch is essentially stock, but beefed up with an HPN ceramic plate, and the R 100 R gearbox has inverted gears for faster and easier shifting. But just as the bike was coming together, luck ran out: Séb broke his leg badly in a BMX crash and ended up in a wheelchair. Friends rallied round to help, and Sprintbeemer was finished—the night before the journey over the border to Glemseck. 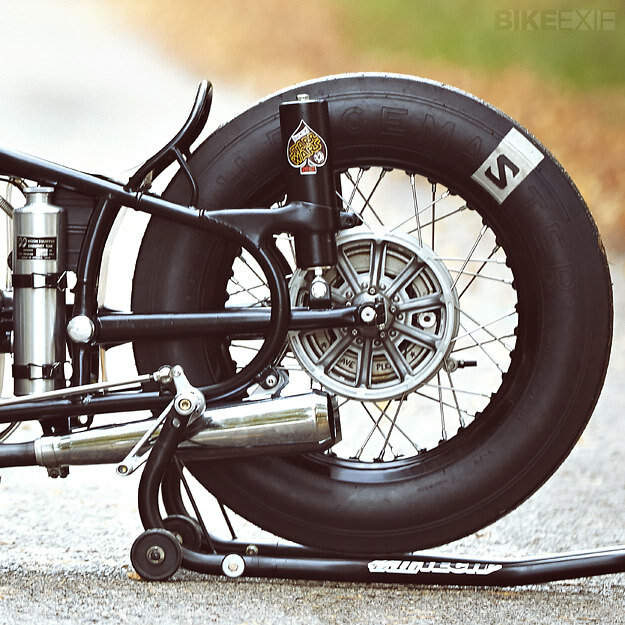 Sylvain Berneron—aka Holographic Hammer—drove Séb and his bike to Glemseck in a truck. Sylvain then donned leathers and a helmet and sent Sprintbeemer screaming down the track to victory, adding to the trophy he won on his own Suzuki at Wheels & Waves. As winter approaches in France, Séb is rolling the BMW back into his workshop. But keep an eye out for it in the spring. With a new, shorter-ratio transmission due to be installed, Sprintbeemer promises to be even faster next year. Images by Daniel Beres. Follow the adventures of Séb via his Facebook page.